To write an effective real estate cover letter, you’ll need to showcase your ability to sell. Download the sample below to discover what you should include in your cover letter. As advertised on the Website’s Name website, I would like to apply for the position of Real Estate Manager at Company’s Name. 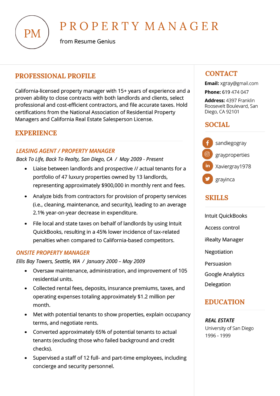 With a Bachelor’s in marketing, more than 8 years of experience in the real-estate industry, and exceptional Estate Management skills to complement this experience, I am confident in my abilities to become a central element to your team. My ability to provide planned marketing and property procurement support to clients has been very helpful in acquiring an extensive client-base. In my present role as Senior Real Estate Agent at Duncan-Wertz Realtors, I have demonstrated a drive to exceed my targeted quotas by creating sales plans to build new client connections. I have also prepared documents, conducted training programs for sales agents, and managed daily administrative tasks associated with the role. Furthermore, I have gained extensive knowledge and insights into providing outstanding customer services by anticipating client needs. Having previously worked with Mccoy Realty for more than 4 years as a Real Estate Agent, I have become proficient in handling concerns from all types of customers. I am an excellent communicator who possesses the ability to engage staff on all levels of an organization. My resume is enclosed and it will give you further insight into my skill-set, accomplishments, and experience in this sector. I look forward to the opportunity of an interview to discuss my application further.